Distribution Worldwide, but most diverse in the tropics and subtropics. Biology Parasitoids or hyperparasitoids of insects that are usually in a concealed situation or parasitoids of insect or spider eggs. Ashmead, W.H. 1896. On the genera of the Eupelminae. Proceedings of the Entomological Society of Washington 4: 4–20. Cameron, P. 1884. Hymenoptera (Families Tenthredinidae—Chrysididae). Biologia Centrali-Americana. Insecta, 1, 1–487, 20 pls. Gibson, G.A.P. 1995. 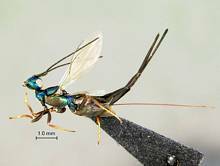 Parasitic wasps of the subfamily Eupelminae: classification and revision of world genera (Hymenoptera: Chalcidoidea: Eupelmidae). Memoirs on Entomology, International 5: 421 pp. Gibson A.P. 2017. Synonymy of Reikosiella Yoshimoto under Merostenus Walker (Hymenoptera: Chalcidoidea: Eupelmidae), with a checklist of world species and a revision of those species with brachypterous females. Zootaxa 4255: 1–65. doi:http://dx.doi.org/10.11646/zootaxa.4255.1.1. Gibson A.P. 2017. Revision of world Ooderella Ashmead (Hymenoptera: Chalcidoidea: Eupelmidae), with description of the first males for the genus. Zootaxa 4289: 1–74. doi: http://dx.doi.org/10.11646/zootaxa.4289.1.1. Risbec, J. 1952. Contribution à l'étude des Chalcidoïdes de Madagascar. Mémoires de l'Institute Scientifique de Madagascar, Série E 2: 1–449. Waterston, J. 1916. Chalcidoidea bred from Glossina morsitans in Nyasaland. Bulletin of Entomological Research 6: 381-393. Waterston, J. 1916. Notes on African Chalcidoidea - V. Bulletin of Entomological Research 7(2): 123-132. Photographs © Simon van Noort and Hamish Robertson (Iziko Museums).